Danby DBC026A1BSSDB is a stainless beverage center with a 2.6 cubic feet (123 liters) capacity that you can fit in 95 standard sized 12-ounce cans. It is a mini fridge designed for beer, soda, water, juice and any beverages you may want to keep cold. It is a fairly new release fridge that is one of the best sellers on Amazon.com with an average rating of 4 stars. 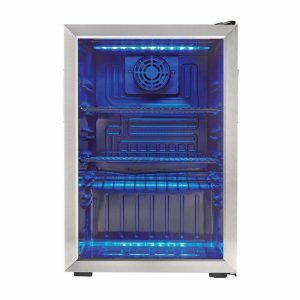 It comes with a mechanical thermostat that is easy to operate and that helps keep your drinks chilled. You’ll find three solid no tip wire shelves that are adjustable and slide out easily. Danby is easy on the eyes with the black cabinet and a stainless steel door frame that make it sturdy and durable. It also comes with a towel bar door handle which looks nice. You can see the contents easily through its transparent tempered glass door and you do not need to open the door and let the cold air escape. Although this one has a 95 x 12 ounce (355ml) can fridge capacity you can put in up to 120 smaller cans if you need to. You have the blue interior LED lights that are designed to stay cool and that you can turn on and off via the switch on the top right side of the door. You can certainly change the blue LED light if you prefer white or other color but the blue light is quite nice. It has a reversible door and you can install it to open from the left or right. The wire shelves are easily removable and you can take out one of them and put your wine bottles. Danby Stainless Mini Fridge weighs 54.6 pounds and measures 19.6 x 17.5 x 26.7 inches, is lightweight and compact and is designed as a free-standing or standalone unit. And it can also be built into a counter as long as there is enough space on the sides and the back. It works quietly if you’re sensitive to noise and you’ll hardly hear a thing. It has an efficient R600a refrigerant that is also friendly to the environment. The temperature range is between 42.8 and 57.2 degrees Fahrenheit and if you like your beer or other drinks very cold then it may not be for you. A couple of customers commented on the minimum temperature as they would like their drinks colder than 6 degrees Celsius (42.8 degrees Fahrenheit). Warranty offered is 12 months on labor and parts by the manufacturer and a convenient in-home service is offered. Please note that this cooling unit is designed for indoor use and not for outside installation including carports or garages. 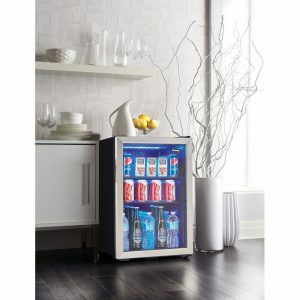 Danby Mini Beverage Center is a great little beverage cooler overall for the money it costs.